Google+ Adventures with Baby Boo Bear: My exciting news! If you are my friend on Facebook you may have noticed a few days ago I made a post about a life changing decision. If you know me IRL you may have heard me change the subject when talking about a course I am taking....after talking with Craig & my Mom I have decided to post this here. To hold myself accountable, push me to do better and just to keep you in the loop! I am so excited about a program I have enrolled in. It isn't a career change right now but I am hoping someday to have a full case load and move to this profession full-time! So here it is friends. Why I am choosing to become a Labour Doula. Prior to having a baby I had never spent time in a hospital. There was never a need. Perhaps this is why they scared me. The unknown. Hospitals were for sick people. Pregnant women aren't sick so why should they have to have a baby there? There weren't any birthing centres near where I lived and we didn’t live in a house that would be conducive to having a home birth. Reluctantly, I chose a hospital birth. No big deal. I was under the care of The Barrie Midwives. I'd be in, have my baby and be back home fast! Long story short I was sent for a 2nd opinion with an O.B. at 38 weeks. For the next 10 days I was back and forth to the hospital almost daily, dealing with non-stress tests, biophysical profiles and possible inductions. Why? My baby was measuring large. That was it. Fortunately I ended up in the care of an amazing O.B. who refused to induce me for that reason alone and I was returned to my Midwives good hands. That glorious Tuesday night after 10 days of ordeal my water broke. Au natural. My contractions came fast and hard after that. I was not prepared. I was supposed to experience small contractions, increasing in length and pain. Then my water would break. Not mine. Mine came fast, hard and with ZERO patterns. When I was asked to time them by my Midwife we couldn't. There was no pattern, no breaks. With each contraction I saw my hopes for a natural birth going out the window. I wanted to labour in the water. This was in my birth plan. My birth plan was never reviewed or discussed during my labour. When my water broke I couldn't take a bath. That was my plan. I didn't know what else to do. My stress level grew. Long and short of my birth story: My husband and Mom went into protective mode. They couldn't bear to see me in pain. My sister was there as my cheerleader but having never experienced labour herself couldn't relate to the pain I was experiencing. Emmett was finally born by Caesarian Section. I had every drug in the book pumped into my body. I did not get to hold my son right away (Craig did get skin on skin which I am thankful for). My Midwives were amazing. They knew my desire for a natural birth and they supported me. They also knew this was getting hard and reassured me that if I needed an epidural it wouldn't have been the end of the world. What I truly needed was a support person. Someone experienced and trained. I needed a doula. Unfortunately I didn't know that I needed one until after the fact. I needed resources. Other options. Too be more informed of the choices that I had while I was labouring. Resources my medical staff were too busy focusing on their job – get baby out- to take time to explore. I won't even touch on my experience with breastfeeding my baby. While my O.B. was amazing, she was there to do a job. She had a full schedule. I truly believe had I not been in the post-partum care of my Midwives I would have suffered from post-partum depression. 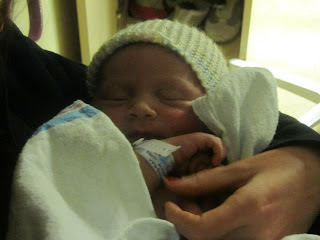 I grieved Emmett's birth and the events that followed for weeks. I couldn't go to playgroups at first because I tear up every time I saw a Mother Breastfeeding her child. My heart sunk hearing of others natural, drug free births. Even those that had medicated vaginal births bothered me. I cried daily to myself, to my husband about something that I didn’t have the power to change. My son's head was too large for my birthing canal. There is NOTHING that could have changed the outcome of my birthing experience, nothing. His head was right there for hours. It should have been quick and simple according to my nurses. A Caesarian was the ONLY way to safely get my child out. Finally, 6 months after his birth, I had accepted that. Now, I enjoy telling the story of Emmett's birth. I enjoy hearing of others experiences. One day everything just switched. I could handle this now. I stopped staring at Mother's Breastfeeding their children. It was okay that they could and I couldn't. Having a Caesarian and not being able to breastfeed did not make me a bad Mother. I was a good one and now I finally knew it. I wouldn't let anything hold me back from loving and caring for my child. I had toyed with the idea of becoming a Doula immediately after his birth. At the time I figured it was a wild idea spurred by my unpleasant experiences. Still, I bookmarked the pages on becoming a Doula, workshops, trainers, references, etc….just in case. Jump forward to now. I know that I need to help women through labour, birth and postpartum. I need to have references, tools, plans and knowledge to help these women cope with whatever their birthing experience presents to them. I need to be the woman, companion and support that I should have brought to the delivery room with me. I belong to an amazing online support group with other December Mom's. We come from all over North America. Their encouragement and support has allowed me to make this decision. My husband's unwavering love and encouragement of my dreams has led me here. My experiences with my son have inspired me to do this. I don't know where this will lead me in the future. I know it can take years to gain the experience I need to be successful as a Doula. Yesterday I started the process to becoming a certified Doula. Yesterday it scared the hell out of me to take this on. Wow! That is amazing! Good for you! It was breaking my heart reading your story! I'm so,glad that you are doing well now, you are one strong mama! I know exactly how you feel and I think new moms are really not prepared enough or know enough about the options they have. There are a few things I would re-do of I could as well. SO exciting! I cannot wait to hear about your journey. It's one I hope to be on in the near future! <3 You girl. I'm so glad to be one of the lucky gals who get to walk through this with ya!